Born in 1929 A.D, Syed Mohammed Yousha “Faizi” was his adapted name in poetry. He was born into a religious family and he was the known eighth generation ALIM and his father Allama Qais Zangipuri was an internationally recognized Sha’er-e-Ahle Bayt(a.s). He was born in Zangipur district of Ghazipur. Zangipur requires no introduction amongst the community of keen followers of Shia theology for its title as “Seat of Islamic Theology” in the yesteryears. He lost his mother at a very tender age of 12 and had his education at Jawadia Arabic College, Banaras. During his education itself his passion for Shaeri was well known, why not because he had inherited the same from his father. He was a self made man, refined in manners, always stressing the performance of religious duties, observance of Islamic tenets. He was a great azadar and his death on Sham-e- Ghariban testifies it. He has written many books on various aspects of Islam. He began his career as Imam-e-Juma in late 60’s in Ranchi, later served as imam-e-Juma at Basravi masjid in Kolkata and later in the year 1975 on the invitation of AnJuma n-e- imamia took up the responsibility as imam-e-Juma in Askari masjid Bangalore where he served till the end almost for 32yrs.He along with others brought Bangalore AZADARI, Maqasad and other religious activities to international recognition. He served as a humble patron in various religious organizations, including member Karnataka State Board of Wakfs. He was a learned and practical Alim, who would simplify complicated matters with ease any masaa’el (Islamic Laws) so as to make it interesting and practical and was an equally eloquent Zakir - e – Ahlebait(a.s) and Sha’er. It was a unique amalgamation , seldom it would be difficult to say what he is best at . His passion for sha’eri was unparalled. His love for his native Zangipur was enormous. In his entire life he could not visit Zangipur only on 5 occasions. It was his love for his watan which took him there even after his death, 2500 Kms from Banglore. He was known for his akhlaq and mehman nawazi and that gave him outmost satisfaction. He was loved adored by all his relations, not only respected by his own community, but people across all religions respected him. His funeral at Zangipur was a testimony for that where people across all faiths congregated in chilling winter till the late evening to pay their tributes to him. Rubaiyat of Qais Zangipuri in two different editions. Later compiled Yaad-e-Karbala, collection of few well known nauhas of Qais Zangipuri. 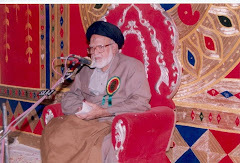 Just days before his last breaths, he released the audio and video(VCDs) version of Yaad-e-karbala Vol-2, compiled by his son Saulath Abbas and earlier vol-1 compiled by his third son Majlisi Faizi. His well known sher for azadari was “BUS ISLIYE AZEEZ HAI YE ZINDAGI HAMEY, HUM MARKE PHIR HUSSAIN KO RONE NA PAENGE”. The trend mashallah continues as his son Syed Farqaleetha Ali Hussainy is serving as resident Alim in USA. His son Syed Qasid Abbas Hussainy is pursuing his Ilm-E-Deen(Islamic Education) and shall continue further. Zangipur is a popular town in district Ghazipur situated about 50 miles from Varanasi erstwhile Banaras. This piece of web is created with the idea of highlighting the facts about Zangipur and the achievements of the legendary personalities who hailed from this place as well as those who are presently making their mark elsewhere across the world.